Please do yourself a favour and do not order such an expensive item from China, it would just end in tears. 2600mAh battery does not fill me with confidence. Unless charging your mobile twice a day is current trend? 2600mAh battery does not fill me with confidence. Unless charging your …2600mAh battery does not fill me with confidence. Unless charging your mobile twice a day is current trend? I have to say, my Moto Z battery still easily lasts a day unless I'm "caning it" all the time. It's got "Turbo Charge" as well which helps mitigates charging requirements. this phone has some serious wifi and bluetooth issues - i got one couple of weeks ago from Amazon, loved everything about it but could not get the wifi or bluetooth to come on, after spending hours on Google for a solution there isnt one except sending it for motherboard replacement. Mine easily lasts a day too. And as you say, the Turbocharge works very well so a few minutes charge brings the phone back up to full. I had a faulty screen and a faulty Bluetooth unit. Both issues were fixed in a week by Motorola, but they ask for proof of where you purchased it from. I had a faulty screen and a faulty Bluetooth unit. Both issues were fixed …I had a faulty screen and a faulty Bluetooth unit. Both issues were fixed in a week by Motorola, but they ask for proof of where you purchased it from. Probably made in the same factory but they won't fix their own poorly made devices .... Speaks volumes really. just to add i honestly don't believe its a motherboard issue but they have screwed up the software update, problem is that you cant upgrade as you need WiFi to download the update and apperantly the minor updates are patches so that doesnt help. This is based on some info that was poseted by the clever people on XDA. My Bluetooth which was working perfectly got screwed up with an update and it needed to be sent back for a new motherboard! That said my Android 7 November update installed perfectly this morning and Android 8 (Oreo) is currently being tested by Motorola, so expect that by the end of the year. Battery is appalling, so I've taken to using the battery back from Incipio full time, so I get a 5000mAH battery and a full day on maximum usage or down to 40-50% on the main battery on an average day. Turbo Charge (or Quick Charge 3.0) helps when times are desperate! just to add i honestly don't believe its a motherboard issue but they have …just to add i honestly don't believe its a motherboard issue but they have screwed up the software update, problem is that you cant upgrade as you need WiFi to download the update and apperantly the minor updates are patches so that doesnt help. This is based on some info that was poseted by the clever people on XDA. It's easier to replace a motherboard than test their updates properly! If you get stung with import duty as well, you may as well buy one from a UK supplier for £300. The warranty is needed, as mine may need to go back a third trimester due to intermittent reboots! 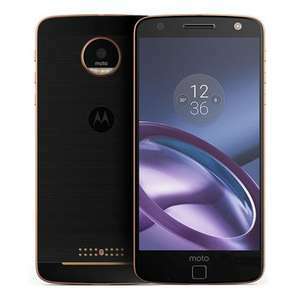 I've had my Moto Z a while and everything works great, battery life better than expected. I had to return my first one to be fixed as speaker crackled on calls, It was fixed and returned within a week. It was still crackling so they replaced it which took a little longer. As it transpires it's something to do with the frequency the network uses, it gets interference. It's fine on other networks and has improved recently but still get the odd crackle on Three. Got one from J Lewis for £299 6 months ago. Good phone, but possibly actually too thin - makes it difficult to hold. Since adding the Moto mod battery pack it's much easier / comfier (yes, the standard battery did tend to need a boost late afternoon in normal use). The Turbo Power battery turns it into a beast - no more battery anxiety. And trying to type whilst it's plugged into the power is difficult / weird. More than happy with it, decent and fast, yes battery is a weak point but the turbo charge helps. I grabbed a 20k mah ravpower pack and that's left in the car for satnav n stuff other than that lasts a day easy. Not had any difficulties with WiFi or Bluetooth. Probably made in the same factory but they won't fix their own poorly made …Probably made in the same factory but they won't fix their own poorly made devices .... Speaks volumes really. Yeah but most companies are the same in that respect, to protect their regional sales outlets they make life hard for those that buy out of their own region to discourage us getting the same product from a cheaper region. Like you say, they're probably all made in the same factory in China.